Saudi students and seek assistance at local mosques. He counted on their break- ing off any such relationships once they moved to the East Coast.6 Our inabil- ity to ascertain the activities of Hazmi and Mihdhar during their first two weeks in the United States may reflect al Qaeda tradecraft designed to protect the identity of anyone who may have assisted them during that period. After the pair cleared Immigration and Customs at Los Angeles International Airport, we do not know where they went.8They appear to have obtained assis- tance from the Muslim community,specifically the community surrounding the King Fahd mosque in Culver City, one of the most prominent mosques in Southern California. Bayoumi, then 42 years old, was in the United States as a business student, supported by a private contractor for the Saudi Civil Aviation Authority, where Bayoumi had worked for over 20 years.18 The object of considerable media speculation following 9/11, he lives now in Saudi Arabia, well aware of his notoriety. Both we and the FBI have interviewed him and investigated evi- dence about him. Bayoumi is a devout Muslim, obliging and gregarious. He spent much of his spare time involved in religious study and helping run a mosque in El Cajon, about 15 miles from San Diego. It is certainly possible that he has dis- sembled about some aspects of his story, perhaps to counter suspicion. On the other hand, we have seen no credible evidence that he believed in violent extremism or knowingly aided extremist groups.19 Our investigators who have dealt directly with him and studied his background find him to be an unlikely candidate for clandestine involvement with Islamist extremists. to verify Abdullah's alleged jailhouse statements, despite investigative efforts. 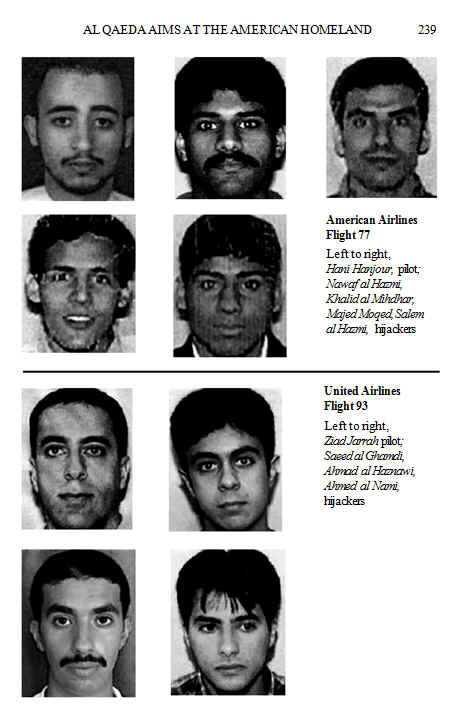 In sum, although the evidence is thin as to specific motivations, our overall impression is that soon after arriving in California, Hazmi and Mihdhar sought out and found a group of young and ideologically like-minded Muslims with roots in Yemen and Saudi Arabia, individuals mainly associated with Mohdar Abdullah and the Rabat mosque.The al Qaeda operatives lived openly in San Diego under their true names, listing Hazmi in the telephone directory.They managed to avoid attracting much attention. In mid-September,Atta and Shehhi applied to change their immigration sta- tus from tourist to student, stating their intention to study at Huffman until September 1, 2001. In late September, they decided to enroll at Jones Aviation in Sarasota, Florida, about 20 miles north of Venice. According to the instruc- tor at Jones, the two were aggressive, rude, and sometimes even fought with him to take over the controls during their training flights. In early October, they took the Stage I exam for instruments rating at Jones Aviation and failed. Very upset, they said they were in a hurry because jobs awaited them at home. pilot's license. Several more months of training yielded him a commercial pilot certificate, issued by the Federal Aviation Administration (FAA) in April 1999. Ali opened a bank account in Dubai for Hanjour and providing the initial funds for his trip. On December 8, Hanjour traveled to San Diego. His supposed destination was an English as a second language program in Oakland, Califor- nia, which he had scheduled before leaving Saudi Arabia but never attended. The U.S. legal attaché ("Legat") in Prague, the representative of the FBI, met with the Czech service's source. After the meeting, the assess- ment of the Legat and the Czech officers present was that they were 70 percent sure that the source was sincere and believed his own story of the meeting. Subsequently, the Czech intelligence service publicly stated that there was a 70 percent probability that the meeting between Atta and Ani had taken place.The Czech Interior Minister also made several statements to the press about his belief that the meeting had occurred, and the story was widely reported. The FBI has gathered evidence indicating that Atta was in Virginia Beach on April 4 (as evidenced by a bank surveillance camera photo), and in Coral Springs, Florida on April 11, where he and Shehhi leased an apartment. On April 6, 9, 10, and 11,Atta's cellular telephone was used numerous times to call various lodging establishments in Florida from cell sites within Florida.We cannot confirm that he placed those calls. But there are no U.S. records indicating that Atta departed the country during this period. Czech officials have reviewed their flight and bor- der records as well for any indication that Atta was in the Czech Repub- lic in April 2001, including records of anyone crossing the border who even looked Arab.They have also reviewed pictures from the area near the Iraqi embassy and have not discovered photos of anyone who looked like Atta. No evidence has been found that Atta was in the Czech Republic in April 2001.
denies knowing of any other Iraqi official having contact with Atta. KSM and Binalshibh both deny that an Atta-Ani meeting occurred. There was no reason for such a meeting, especially considering the risk it would pose to the operation. By April 2001, all four pilots had com- pleted most of their training,and the muscle hijackers were about to begin entering the United States. After training in Afghanistan, the operatives went to a safehouse maintained by KSM in Karachi and stayed there temporarily before being deployed to the United States via the UAE.The safehouse was run by al Qaeda operative Abd al Rahim Ghulum Rabbani, also known as Abu Rahmah, a close associate of KSM who assisted him for three years by finding apartments and lending logis- tical support to operatives KSM would send. As we mentioned in chapter 2, while in Sudan, senior managers in al Qaeda maintained contacts with Iran and the Iranian-supported worldwide terrorist organization Hezbollah, which is based mainly in southern Lebanon and Beirut.Al Qaeda members received advice and training from Hezbollah. We have found no evidence that Iran or Hezbollah was aware of the plan- ning for what later became the 9/11 attack.At the time of their travel through Iran, the al Qaeda operatives themselves were probably not aware of the spe- cific details of their future operation. The majority settled in Florida. Some opened bank accounts, acquired mail- boxes, and rented cars. Several also joined local gyms, presumably to stay fit for the operation. Upon first arriving, most stayed in hotels and motels; but by mid- June, they settled in shared apartments relatively close to one another and Atta.130 Though these muscle hijackers did not travel much after arriving in the United States, two of them,Waleed al Shehri and Satam al Suqami, took unusual trips. The three Hamburg pilots-Atta, Shehhi, and Jarrah-took the first of their cross-country surveillance flights early in the summer. Shehhi flew from New York to LasVegas via San Francisco in late May. Jarrah flew from Baltimore to LasVegas via Los Angeles in early June.Atta flew from Boston to LasVegas via San Francisco at the end of June. Each traveled in first class, on United Airlines. For the east-west transcontinental leg, each operative flew on the same type of aircraft he would pilot on September 11 (Atta and Shehhi, a Boeing 767; Jar- rah, a Boeing 757).133 Hanjour and Hazmi, as noted below, took similar cross- country surveillance flights in August. Although Atta and Hazmi appear to have been inVirginia at about the same time in early April, they probably did not meet then.Analysis of late April com- munications associated with KSM indicates that they had wanted to get together in April but could not coordinate the meeting.137 Atta and Hazmi probably first met in the United States only when Hazmi traveled round-trip from Newark to Miami between June 19 and June 25. Yet KSM has also stated that by the summer of 2001, he was too busy with the planes operation to continue planning for any second-wave attacks. More- over, he admits that only three potential pilots were ever recruited for the alleged second wave, Moussaoui plus two others who, by midsummer of 2001, had backed out of the plot.161 We therefore believe that the effort to push Moussaoui forward in August 2001 lends credence to the suspicion that he was being primed as a possible pilot in the immediate planes operation. On August 3, for example, Atta and Binalshibh discussed several matters, such as the best way for the operatives to purchase plane tickets and the assign- ment of muscle hijackers to individual teams. 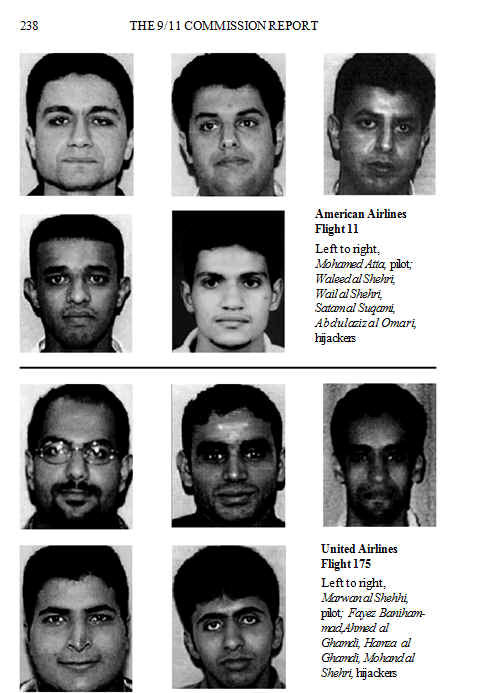 Atta and Binalshibh also revis- ited the question of whether to target the White House.They discussed targets in coded language, pretending to be students discussing various fields of study: "architecture" referred to the World Trade Center, "arts" the Pentagon, "law"
While tactical preparations for the attack were nearing completion, the entire operation was being questioned at the top, as al Qaeda and the Taliban argued over strategy for 2001. Our focus has naturally been on the specifics of the planes operation. But from the perspective of Bin Ladin and Atef, this opera- tion was only one, admittedly key, element of their unfolding plans for the year. Living in Afghanistan, interacting constantly with the Taliban, the al Qaeda leaders would never lose sight of the situation in that country. According to KSM, in late August, when the operation was fully planned, Bin Ladin formally notified the al Qaeda Shura Council that a major attack against the United States would take place in the coming weeks.When some council members objected, Bin Ladin countered that Mullah Omar lacked authority to prevent al Qaeda from conducting jihad outside Afghanistan. Though most of the Shura Council reportedly disagreed, Bin Ladin persisted. The story of dissension within al Qaeda regarding the 9/11 attacks is prob- ably incomplete.The information on which the account is based comes from sources who were not privy to the full scope of al Qaeda and Taliban planning. rely on al Qaeda military support. Shehhi and his team targeting United Airlines Flight 175 from Logan Air- port spent their last hours at two Boston hotels.192 The plan that started with a proposal by KSM in 1996 had evolved to overcome numerous obstacles. Now 19 men waited in nondescript hotel rooms to board four flights the next morning.